I had the pleasure of printing up some excellent illustrations by my pal Simon Turner recently. 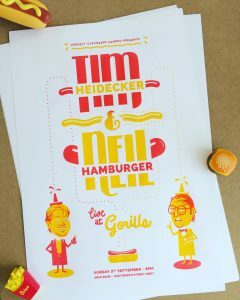 He designed these mega posters for the Tim Heidecker and Neil Hamburger gig at Gorilla. If you missed it, you missed a hilarious treat! Simon has some of these lovely prints leftover, signed by the guys, so get in touch with him if you would like one, and check his awesome work while you’re at it! www.s-turner.com I screen printed these 2 colour prints onto 135 gsm Pristine White G.F Smith Colorplan paper. 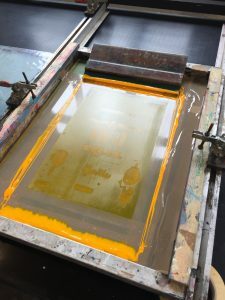 I have a new studio at Hot Bed Press, so am spending more time there, and honing my skills. 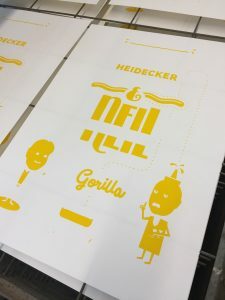 If you are an artist or illustrator with some screen printing requirements, get in touch and I’ll see if I can help!